The ash tree is a tall tangle of feathery limbs at the edge of the park. At some point, unnoticed, shoes began to stipple its branches, like peculiar fruits. They’re the shoes of both children and adults. Mainly sneakers, but of many designs. Some have a branch to themselves, others have become tangled with one another to form intricate mobiles. The shoes don’t seem to harm the tree. In fact, they’ve slowly become part of it. They’ve been there so long that many are now encrusted in lichen. Occasionally, an abandoned shoe will appear on the grass, evicted by gales or rot. I wonder who all of these shoes belong to. Did their wearers skulk home barefoot, having had the shoes ripped from their feet? Did their parents scold them because they’d lost their shoes? Do their former owners still pass by and look longingly at shoes they once loved that are now out of reach? Or did they give them up joyfully in a blithe moment of festivity? I first heard of shoe trees when I read local author Julia Darling’s novel The Taxi-Driver’s Daughter, in which an unhappy teenage girl decorates a tree with stolen shoes. The tree ultimately becomes a symbol to the community. At the time, I wondered which came first, the book or the tree. But I soon learned that shoe trees aren’t unusual. They’re found worldwide and there are many theories to their purpose: a result of bullying or pranks, a rite of passage such as the end of the school year, to signify a nefarious purpose such as the sale of drugs, or even that a person has died. Leaving offerings on trees is an ancient practice. In many parts of the world objects are left tied to branches or hammered into the bark. Trees are adorned with rags and ribbons, food and coins. They’re often known as wishing trees, because the offering is left in return for a wish to be fulfilled. And what else is a Christmas tree if not a tree laden with offerings? 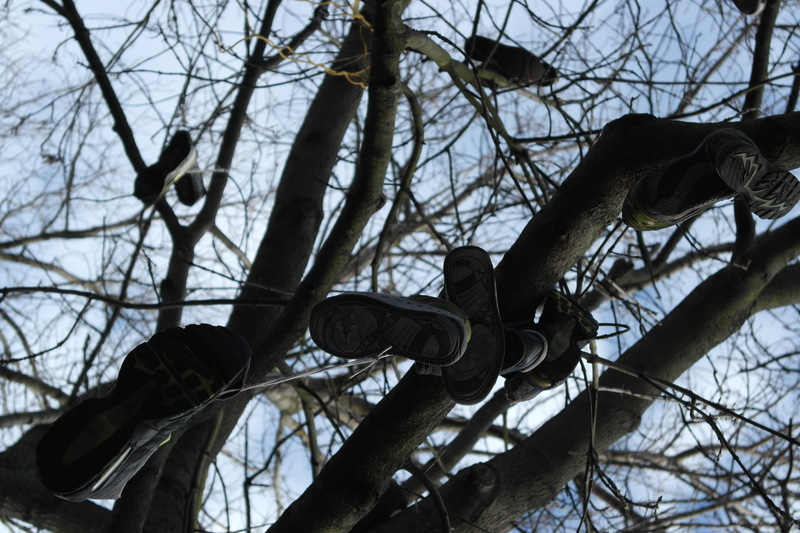 I suspect that our shoe tree began as a prank, perhaps light-hearted, perhaps malevolent. I worry about the children who may have been bullied to facilitate an offering to the shoe tree, but I hope that if this is the case, the tree now cradles and disperses that pain, taking the weight of it as it does the weight of the shoes, drawing it in to become a part of itself. But we offer words as well as objects to trees. 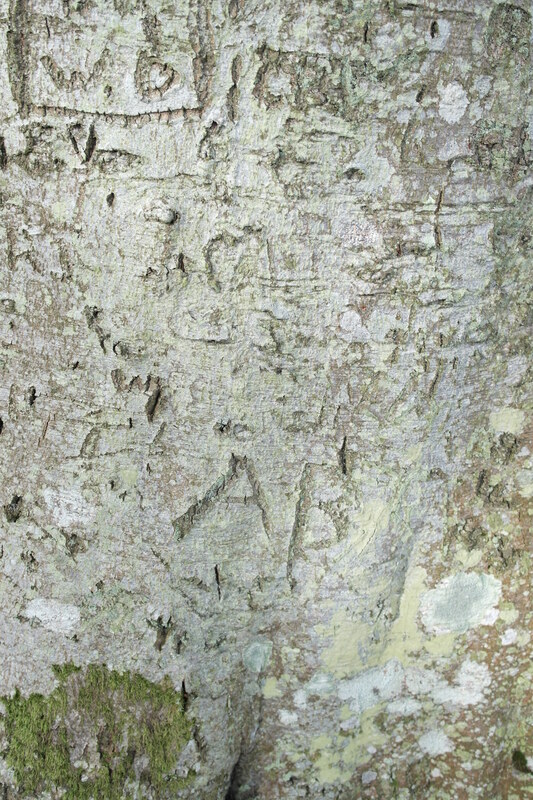 It’s not only lovers who carve their initials into bark. The two beech trees guarding Lady’s Well are covered in the initials of pilgrims. 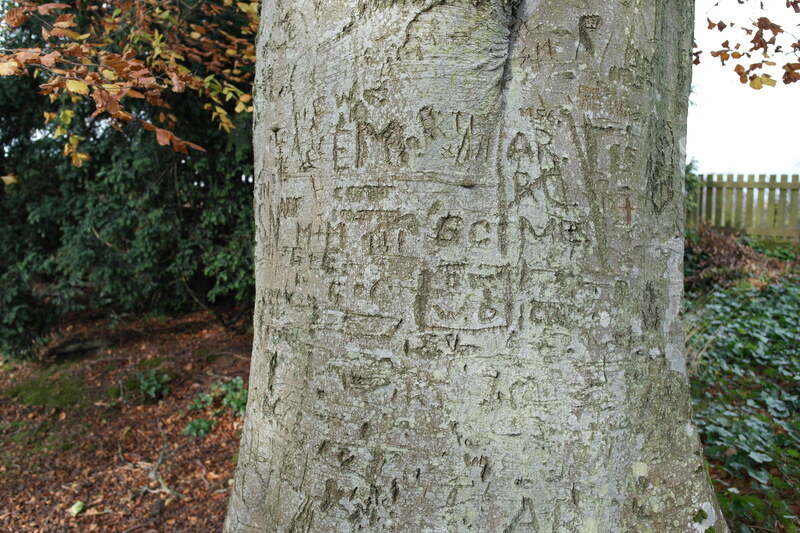 Studies have been done of the graffiti carved into trees across Europe by soldiers in the world wars, including the American GI who told the wife he’d married in secret before leaving for Europe that he would carve his initials on a tree everywhere he went. Carvings in trees are known as arborglyphs. The trees healing process darkens them, making them more visible. We have a need to tell the world that we were here. We connect with a place by leaving something behind. An old tree will have been here before us and is likely to remain after we’ve gone. Trees are silent sentinels that we feel watch over us, a link between the underworld, the earth and the sky. They give a sense of scale and permanence to our daily concerns. We offer them the letters of our names (who we are in the world) and we offer them our shoes (what we travel in). And perhaps they care, drawing strength from our attention. Or perhaps they don’t and the meaning is ours alone. If the tree doesn’t notice, then maybe someone else will and know that we existed, if only for a short while. The desire to be witnessed is always there. And it spreads. Already, shoes have appeared in two of the other trees in the park. And in another park nearby, someone has left some more seasonal offerings. So perhaps one day when I’m ready to dispose of a pair of shoes, I won’t throw them away. I’ll take them to the shoe tree and hurl them into the branches. And maybe I’ll ask the tree, if not for a blessing, then to be my witness, to know that once I walked this way through the world. Some years ago while I was still a student living in a students’ dormitory I woke up at a day in March and saw the tree next to my window all in red bracelets. That shoe tree reminds me of it, just that it was much nicer to look at. There were students from Bulgaria and those decorated the tree with red and white bracelets which they wore during the month of march. They believe there is a saint (or something similar) named “baba Marta” (grandma March) which brings love to the ones who wear something red and white in the remeberance of her person. In april they put the bracelets out on tree branches to give some luck and love to the nature and neighbors. It was lovely to look at the tree and their happy faces. That sounds like a lovely celebration and I’ll bet the trees do look beautiful adorned in red and white. 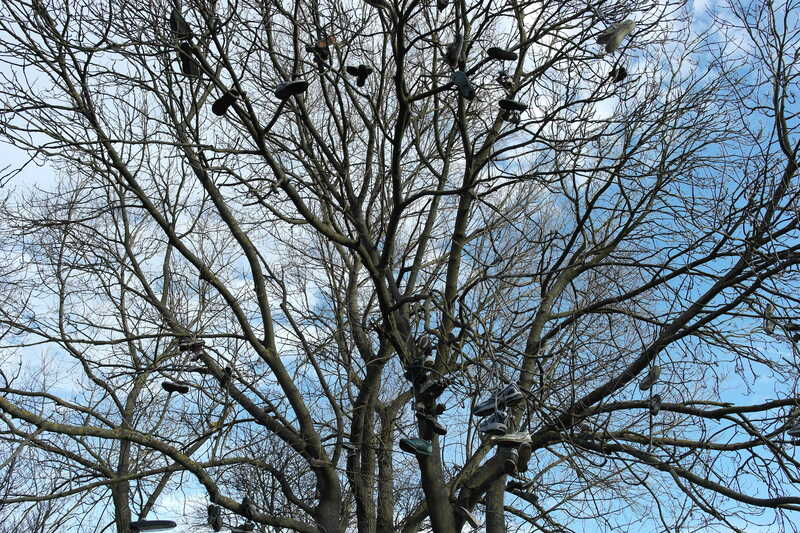 I’ve never heard of or seen a shoe tree; how fascinating! This is a fascinating topic, Andrea. 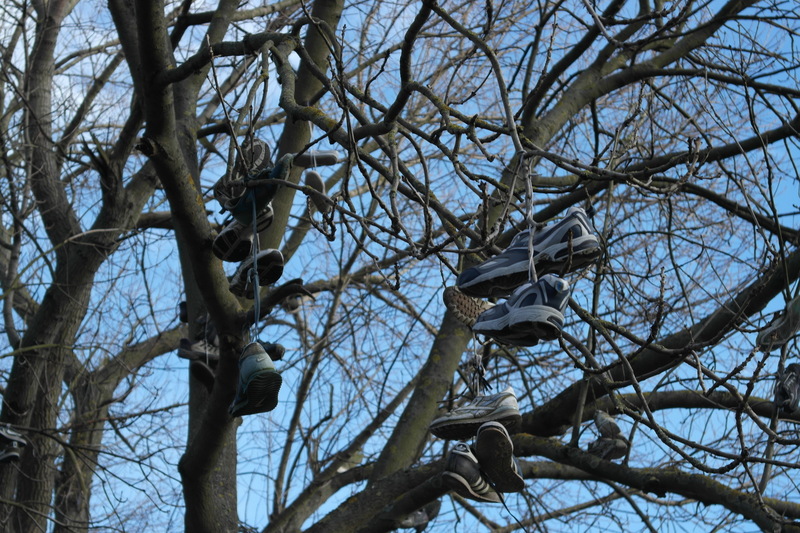 I checked Google for shoe tree images and I was awestruck. They are powerful symbols of … what? Perhaps an innate human desire to link with other human beings who were there before us, adding to the mystery of their anonymity for those who come after. Great photos! Thanks Helga, it’s interesting to think that even if some of them start as a prank, they take on a meaning of their own. Another spell-binding post…I LOVE your topic! Wow!…I adore the idea of a tree receiving a pair of shoes and then taking the essence of the wearer right down into it’s sacred root’s and then ‘walking in your shoe’s’ and listening with deep nature-respect to your story and then sending you healing and love…no matter the wearer, no matter the story. My God I love tree’s!…thank you for reminding just how much! Thanks Tracey, I like your thoughts on the tree taking the shoes and ‘walking in them’. I’ve never seen a shoe tree, Andrea. I have seen shoes dangling from power lines and phone lines that cross over highways. I always wondered who they belonged to and why they were there. I would never think to fling my shoes up into a tree to leave my mark. I hope I can leave my mark simply by the lives I touched during my time on this earth. Quietly contemplative and fascinating… I had only heard of the shoe tree in the Nevada desert (in the general area of the Burning Man festival). I’d no idea these were so widespread. I suppose there are that many people needing something to bear witness, to leave something of themselves. Beautiful. Until you mentioned Christmas trees, I thought I was previously unfamiliar with this custom, but I agree with your thought that leaving shoes/caring initials into tree bark is done to ensure identity is preserved and resonates as long as the tree stands. Very thought-provoking and powerful post. Thanks Elizabeth, yes we follow these traditions without really knowing why sometimes, even though we sense the magic behind them. I’ve spotted some shoe trees, too. Like you, I wonder what inspired the shoe tossing, and I hope each pair has a worthwhile story behind it rather than just doing it without thought or motive. Makes the idea more appealing, and your lovely post captures why. Thanks Carrie – that’s the fascinating part isn’t it, wondering who and why – and I think even if the first pair was done without thought, it takes on a momentum and meaning of its own. Cool!!! There are two trees on one of our hikes that has Christmas ornaments on them. We smile every time we see it. With the shoes, I am reminded of the movie Big Fish, where people throw their shoes into a tree to become citizens of this beautiful fantasy town. Have you seen it? It’s one of my faves. Beautiful Andrea 🙂 We don’t have a shoe tree in our area but we do have shoes dangling from power lines. I believe teens do that. I have come across several trees in our mountains bedecked with ribbon and cloth and it does appear to me like people making offerings. 🙂 we’ve come across two more in other parts of the ‘back country’ here. Fuel for the imagination! Now that is a bizarre fence! I find it interesting that ‘vandals’ have been removing the bras and the shoe tree that Teagan referred to in Nevada was cut down by vandals. I don’t think these things are always pretty, but in some ways, once they’ve begun it’s a shame to ‘clean them up’ as the bra thieves said, because by then they’ve taken on a new meaning and become part of the landscape. I suppose some would say that the trees and the fence have been vandalized but that is no reason to be a vigilante vandal. The bra fence is bizarre. Sometimes I wonder if it could be seen as a protest against what is surely the world’s most ill-fitting garment, the bra. Most of them are not fit for purpose so might as well continue a life of no useful purpose on a fence in the middle of nowhere! And I’m learning about others Helen – like the ‘bra fence’ Gallivanta refers to – the ‘lock’ bridge is a very evocative one I think. Andrea I drive by a tree near my mums place, its a grand old tree and lately travellers have been nailing their shoes to it. It makes me sad that we humans need to do this. The tree was beautiful and now it has lots of shoes all over the giant trunk. I keep promising to come one dark night and free the tree from the humans curse of trashy shoes. My daughter laughs and says “you keep saying it…why don’t you really do it!” Man theres a story in there somewhere. The hanging shoes don’t look as bad, at first looking at these photos I thought they were ravens…(glasses please). But why can’t we leave stories to be remembered by instead. A much better way I think. I agree with you Kath – the hanging shoes don’t seem to harm the tree, but I don’t approve of nailing something to the bark and personally I’d never carve anything into a tree – I think you should definitely free the shoes and write a post about it! I think it’s part of the same phenomenon Sara, the shoes thrown over power lines. I agree I’d never carve my initials in a tree and I probably couldn’t bring myself to throw some shoes up there, but I do like the idea of all that attention paid and the meaning that comes out of it. Thank you – yes I didn’t know about the arborglyphs either and that they’re studied by archaeologists – the carvings made by soldiers during the wars seem particularly poignant. I enjoyed this piece. It took me down memory lane. Thank YOU. 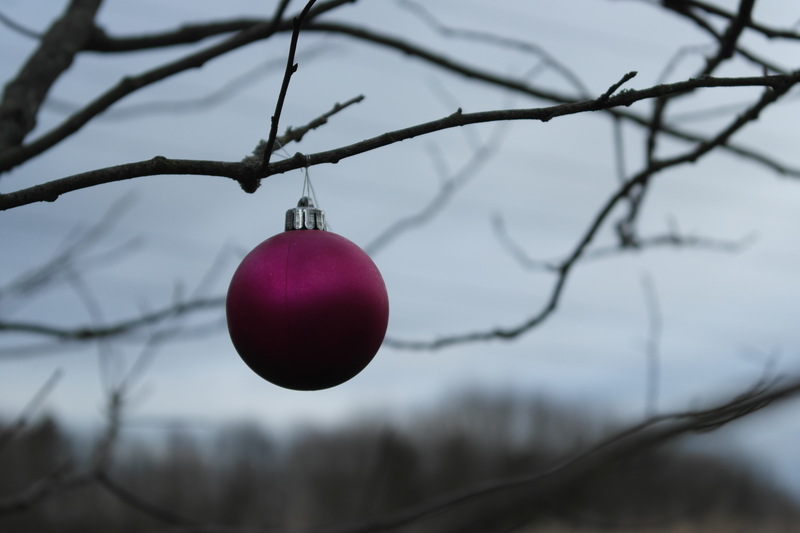 There is something wonderfully human about decorating trees. In some ways it matters not what the intent is. Of course, intent does matter, but that is another tale. Thank you for this marvelous post! Thanks Michael – I agree and I also hope that the people who did it had good intent, but I think these things take on a life of their own, whatever the original intent. Wow, I’ve never seen a shoe tree before! 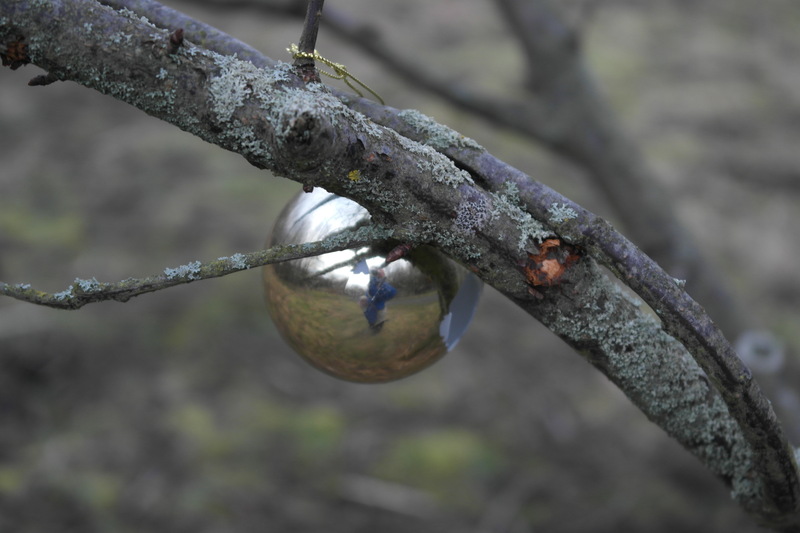 In our local recreation ground, it’s those dog-balls on ropes that end up in trees, after they’ve been thrown by people with a bad sense of direction, such as me. The wood carving on trees, brings to mind carvings made by pupils on the sort of wooden desks we had at school in the old days. Usually these carvings were made by the point of compasses in Maths lessons and filled in with ink during other boring lessons. Now that’s almost as strange an idea as Neil Gaiman would come up with! what stories this post conjures up!! I love the carved initials becoming part of the tree forever more- “though lovers be lost, love shall not” – and these shoes wind walking in a symphony of silent chimes heard by the tree!! Wonderful wonderful post Andrea!! I’ve also seen glass bottles, catching light and hanging in trees when I was in Ireland and elsewhere. Oh I love that ‘wind walking in a symphony of silent chimes’!!! This is a lovely, contemplative post, Andrea. Just love it. The only shoe tree I ever heard about were more like shoe stands that go in a closet for organization. Thanks for teaching me something new. Andrea, how magical! This is all new to me ~ the shoes in trees, I mean. I wonder do people steal up to the tree in the darkness and leave their shoes or could it be a more communal practice? Reminds me a little of the love locks on bridges but somehow hanging up shoes has different connotations than love, I’d have thought. I hoped you might like this one Jean! I’ve never actually seen anyone throw their shoes up there, they just appear like magic, so who knows? I am new to your post and have really enjoyed reading it this morning . My home town Halesowen in U.K has a cluster of hills looking down on it . One of the hills is known as Clent that has a tiny church , nestled within it, is very old tree full of rags and ribbon left by people . We were led to believe the custom goes back to pagan times…so interesting . Love the shoe Idea. This is a first for me! I don’t think the trend has caught on here, but I like it. Reminds me of the museum in D.C. with the shoes of the Holocaust victims. Poignant. Shoes do have a special kind of resonance, even though the origins of this shoe tree don’t have the same horrifying connotations. I’ve always wondered about shoe trees. Thanks for the post. 🙂 I think we want to be remembered and leave our mark on the world. Yup. Unfortunately that’s true. 🙂 I once carved my initials into a table. I didn’t know why I did it at the time. I was a kid, But now I realize I wanted to leave a mark. Caught hell for doing it. 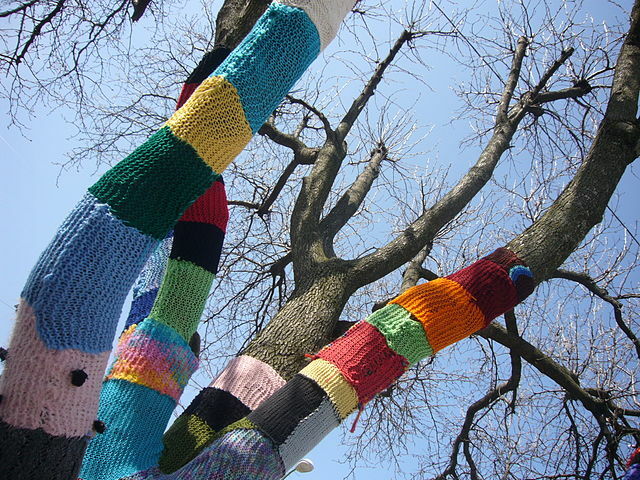 That’s great Gwen, I’d never heard of yarn bombing, but how beautiful! I have seen some palm trees with knitting on them on the coast here (Spain). It looks very funny, but quite sweet somehow! They do look very pretty. There is an everlasting quality to that thought; to know that we are a part of the universe. Gosh, I love this! Tweeted it. So much food for thought. Looks like we were writing twin thoughts at the same time. *grin* My comments are in the companion piece coming up. Leaving offerings on trees is an ancient practice. Didn’t know that. And yes, the Cmas tree makes all the more sense. Lovely reflections as always, AS. Well I never – I’ve never come across shoe trees before. Certainly in Ireland a pair of trainers slung over a wire might signal a drug dealing spot, but that’s a bit different. Also I never knew that about tree carving either – probably that’s dying out these days. Fascinating stuff Andrea. Thanks Roy, yes I don’t often see carvings in trees at all – though that’s probably a good thing…I was surprised it has a proper name and is studied by archaeologists. 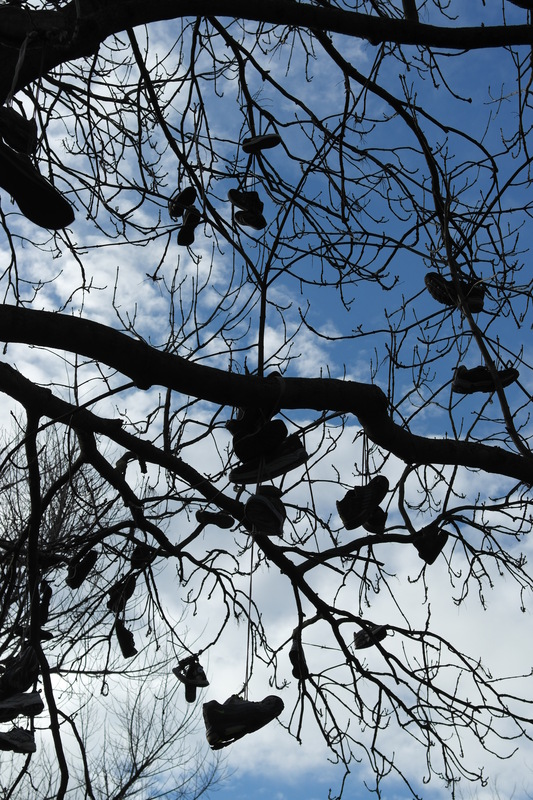 I have never heard of a shoe tree, and I guess I’m of two minds regarding the purpose of lassoing a tree with a bunch of smelly old shoes. Just another way for humans to make their mark, which saddens me because it isn’t about the tree at all. However, I love, absolutely love, your spin on this practice, Andrea, and I will lean on your words if I should ever come across a shoe tree. Thanks Wendy, I’ve never been to Glastonbury but I did see the tree in question on TV the other week – post-vandalism and it did look a bit of a mess, but I have mixed feelings – I see the magic as well as sometimes thinking we should leave well alone. Thanks so much for your comments – your post caught my eye when it came into my inbox – can’t spend long on the computer at the moment due to illness, but I will read it soon! Ohhhh I loved this. Wow. Thanks!! I’ve been hibernating so catching up on my blog reads.. I never heard of ‘shoe trees’ and only very occasionally did I notice a shoe dangling from telegraph wires. Strange way of leaving a trail if you ask me and I’m even more upset about carving into trees Not done. Hi Karin – not a serious illness, but I have had to take an unexpected break, so apologies for not getting back to you sooner. I still remember the post you wrote here https://karinvandenbergh.wordpress.com/2013/10/27/a-delightful-added-bonus/ about the binder that was left for people to write their thoughts about their experiences of that particular place, which is a great way of leaving a trail – that one inspired me to write a short story – nothing to do with leaving a binder for people to write their thoughts, but about leaving something of beauty in a place for no other reason that to do it. I’m sorry to hear that, Andrea. Glad that you’re feeling better, though! We were so busy this weekend with things fun and not fun (taxes in the not-fun category) that we didn’t get up early enough for the equinox activities. One of these days, however! That is so interesting, Andrea!! Excellent article I am going to “press” and reblog one day this week!! Hope your week is going great so far…but it’s only Monday!! Take care! “Someone to tell it to is one of the fundamentals needs of human beings.” Miles Franklin. When I was a girl, there was a very old farmhouse at the edge of our town, Andrea. As the pasture land around it was cleared for development, finally just the house remained with one huge ash tree giving shade in front. I don’t know who hung the first shoes from the tree, but over the years there were hundreds. When the tree finally died, a branch broke off some of the shoes fell off. The amazing thing was that most of the shoes contained handwritten messages: unsigned poems, wishes, prayers. Never heard of a Shoe Tree, but there is a Rag Tree, or rather a Rag Well I want to see this summer. This is an ancient well and a blackthorn tree with the stripes of cloth on it: a wishing tree that I heard people still visit. Yes, I’ve heard of ‘clootie wells’ where they tie rags of cloth on the trees around a sacred spring. I love that – the idea of the bottle tree and also the thought of all those spirits moaning through the night until the sun burns them up. I hadn’t heard of bottle trees so thanks for sharing that Jeanne. I knew a little, but your post inspired me to go learn more about the bottle trees, and indeed, it was fascinating.